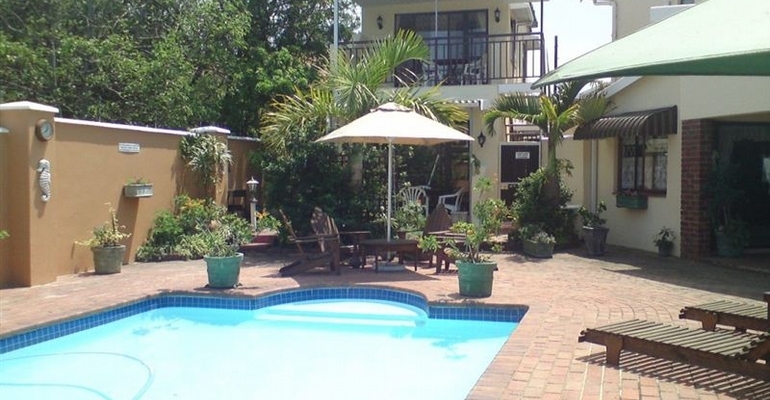 Dunns Haven is located in the holiday town of Scottburgh and consists of two lovely self-catering flats. The flats sleep 2 and 4 and are well equipped for a self catering stay. These comfortable units are both open plan, and overlook a beautiful, secluded courtyard with a sparkling swimming pool, perfect for quiet sundowners or early morning breakfasts. The Top Flatlet sleeps two and is ideal for a romantic getaway. There is one en-suite bedroom with built-in cupboards. The kitchen is well equipped and open plan. The unit is comfortably furnished and the lounge leads onto the balcony which overlooks the courtyard and swimming pool. The Bottom Flat is a family unit that sleeps up to 4 with the main bedroom being en-suite.The open plan kitchen is fully equipped with everything from a stove and oven to coffee cups. The lounge area leads out to a secluded balcony with braai area, which in turn takes you out into our courtyard area and the swimming pool.